I’m sure this post has been done all over the internet, but I’m going to do something most others are not doing. 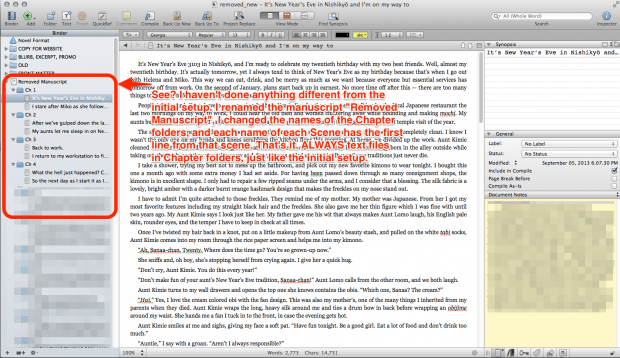 I’m going to show you how I set up my manuscript REMOVED in Scrivener, and I’m going to suggest you follow my advice. Granted there is no ONE BEST WAY to set up a manuscript in Scrivener, but I can honestly tell you that most ways will fail miserably once you get to the compile stage if you don’t do it the way I suggest. There is nothing worse than writing your whole book in some crazy way in Scrivener and then hitting File > Compile and crying tears of frustration because it just doesn’t look the way you want it to. And then you curse Scrivener, even though it was your own fault in the first place :) Be honest with yourself. Now, it’s time to start a new book. 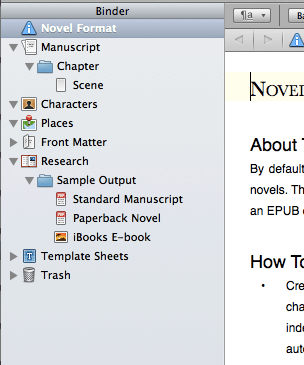 You open Scrivener after watching the tutorials, crack your knuckles, and chose File > New. You get this screen, and hopefully you choose Fiction on the left, and Novel on the right. Don’t choose anything different! You’re writing a novel, right? With chapters and text in those chapters? Right. If you’re not doing this, then I have no clue what you’re writing. Novels have a structure, and there’s a reason why you get this option. 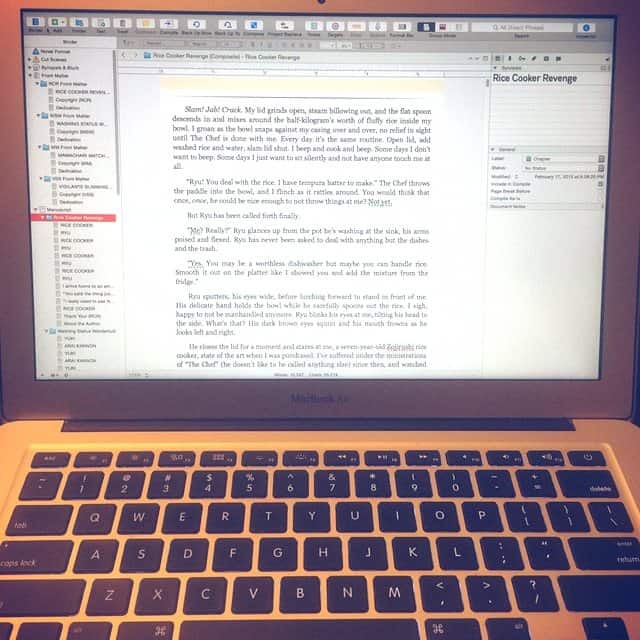 You may be writing a novel with parts but I’ll show you how to add those in later. Start with this. 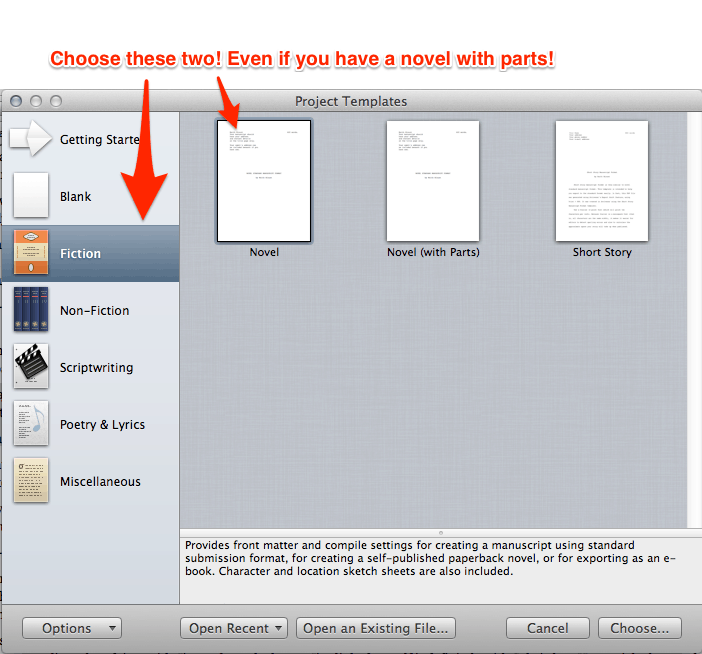 Once you’ve chosen this, Scrivener gets you started with a basic manuscript. Look here! A basic manuscript with a Chapter folder and a Scene text document in it. THIS IS THE STRUCTURE OF A NOVEL. DO NOT DO SOMETHING DIFFERENT. Chapters with text in them. Right? I blurred out a few things so you don’t get any spoilers. Keep doing this until you’ve written a whole book. 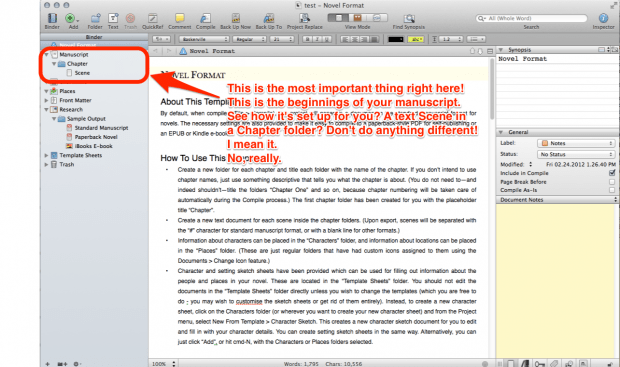 Keep adding chapter folders and text document scenes within each folder as you write. 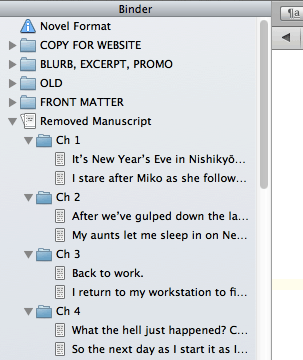 The beauty of Scrivener is in revisions. Look at the image right above. See that scene entitled After we’ve gulped down the last…, originally I had that as part of the previous chapter. But then I decided that first chapter was too long and that scene was better off to start the next chapter. So I just took the text document, and I moved it into the next chapter. Easy Peasy. No selecting>copying>pasting>moving page breaks. Just drag and drop. I have often moved whole chapters upon revisions. TIP: Get used to writing with word count, not pages. Let me explain something to you. Books can be laid out or formatted a ton of ways. Different page sizes, fonts and font sizes, line spacing, paragraph spacing, margins. Your concept of a chapter should be based on word count because that’s what’s going to matter in the end. Do a google search. There are accepted chapter word counts for each genre. When I write my Nogiku Series books, I aim for anywhere from, at the very shortest, 1000 words to, at the very longest, 6000 words, and I’m careful to use scene breaks if my chapters reach the 6000 words mark. Chapter and scene length greatly influence story pacing. It’s important to know what’s acceptable and what’s not. Scrivener will tell you your word count right at the bottom of the window. Keep an eye on it. Ok, so you’ve written your masterpiece, revised it, edited it, revised it, edited it, etc. until it’s perfect? Next up, I’ll show you how to get it from Scrivener to Paperback format so you can upload it to Createspace and have it printed.